July 23rd, 2006: Our beautiful summer continues! Nothing (almost) but warm, sunny weather. How wonderful for those families lucky enough to get their holidays in July! Remember how it used to be at the Park in July - cars lined up the whole length of Lake Avenue by the beach, line-ups at the ice cream window, people waiting their turn at the tennis courts and mini-golf? It’s been a bit like that this summer, and it’s sure good to see. Of course, the weather has been perfect for the lake, the lake itself is right up where it should be, and gas is so steep it costs too much to go any farther. Kind of like the old days! I guess the Park crew didn’t have time to round up the geese this year. Last time I walked down the beach, about six-thirty in the morning, there were fifty or sixty of them hanging out at the west end, and evidence of their presence plentiful on the path around the peninsula. A wedding was photographed there a week or so back, and I heard some grumblings about goose poop! The last couple of years, the geese just disappeared about the time the beach got busy, but not this year. We gave ourselves a real treat last Saturday. We were in Saskatoon, so picked up Lucille and went to a stage play at Rosthern’s Station Playhouse. The title was “Dry Streak”, about a dry-land farm family in the 1980s. There were only seven actors, and one set, which became a farm dining room, a beer parlor, a garden, or the main street of town depending on how they used their lights. The farmer’s son came home from Calgary with his girlfriend and they proceeded to live together “in sin”. The girlfriend, after too many beers one night, stated that she would run down the main street of town naked if only the drought would break. Unfortunately, she said this before witnesses, one of which was the editor of the local newspaper. The farmer’s daughter said if the sprint had to take place, they might as well sell tickets and make some money for the local skating rink. Well, the drought finally did break, and what a surprise ending! The house was packed, and they just loved it! That’s the second stage production we have seen at the Station Playhouse; the last one left us chuckling for days, and this one did too. What a way to spend an evening! We took possession of our motor home last Tuesday and headed west. We stopped at Biggar and checked out the Sandra Schmirler Memorial Park and it was a beauty! It is built all around a major school, sharing parking areas, playgrounds, picnic areas, etc. Beautifully kept, too. We were quite impressed. There is a nice museum in Biggar, too. One unique feature that caught our attention was a Biggar Heritage Album. It is a huge album, maybe 20” x 24”, and families can buy pages in it to display family photos, clippings, etc. There were a lot of pages used, all of them very tastefully done up a la scrapbook style. Most of the pages used were by families with pioneer roots, but we were told that anyone who has ever lived in Biggar is welcome to a page. If I knew the people I could have spent hours browsing through it. 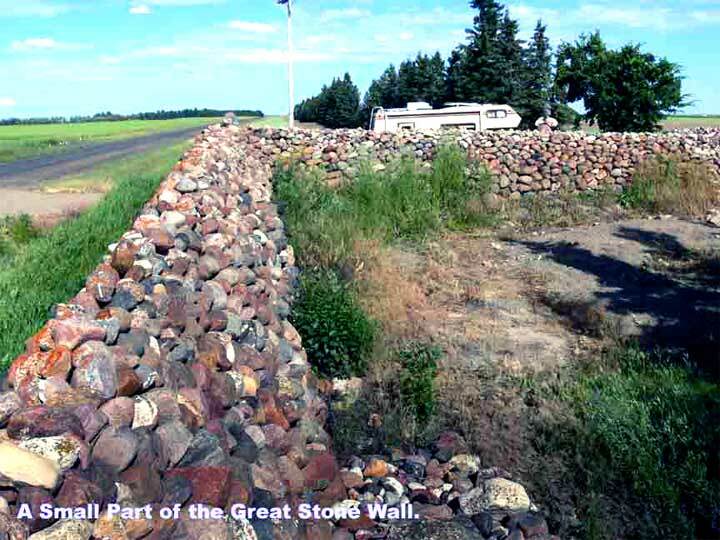 We made our way west and south and just west of Smiley we visited The Great Stone Wall. 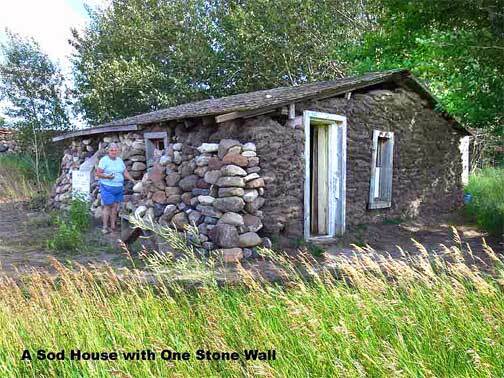 Albert Johnson farmed there, and the rocks he picked over thirty years he carefully built into a wall. It’s about a kilometre long and over six feet tall. 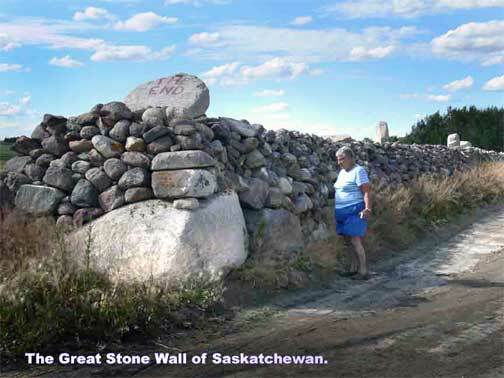 It’s not just a long pile of rocks, either – each has been carefully placed so that in places the wall is almost vertical. It’s one of the great wonders of Saskatchewan, and now we can say we have seen it. Any of you old farmers who complain about having to pick rocks as a kid should have a look at the photos of the Great Stone Wall on my website! 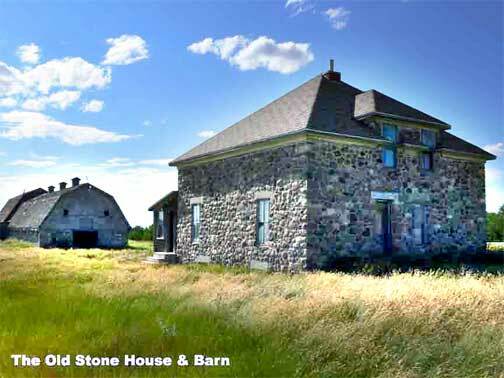 Not far from there is an old Stone House, and a stone walled barn. Both are excellent quality, although disuse has taken its toll on windows, etc. A good stop to grab a few photos. We had picked up some pamphlets about a Harwell Tea Room just east of the Old Stone House so we found our way there. The house was deserted but a man was in the yard having just loaded out a semi of grain. He said the tea room hadn’t run for over four years! Yet their brochures are still in the tourist booths. Tea Rooms come and go. Before you go out of your way to visit one, call ahead and make sure it is still functioning! 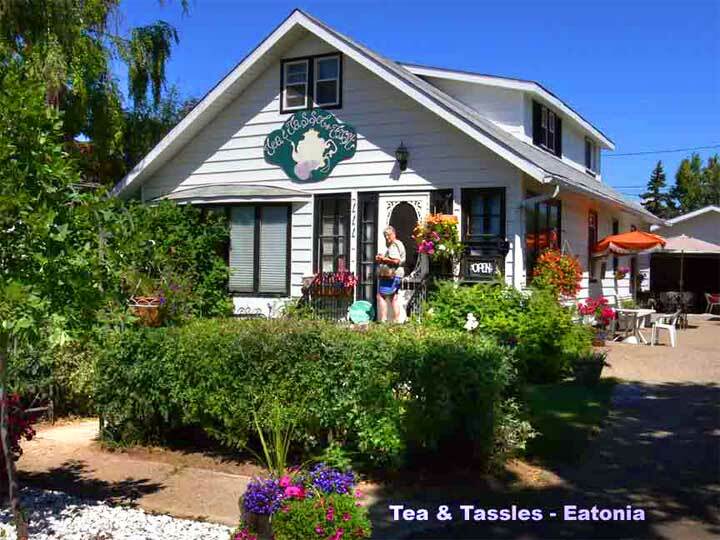 At Eatonia, we had coffee and a cinammon bun (and a very pleasant visit) at Tea & Tassles. 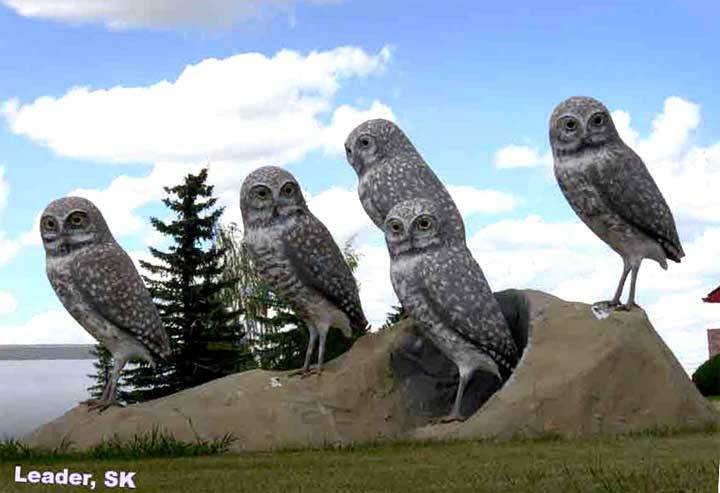 At Leader, we found and photographed the eight wildlife sculptures the town is famous for. At Sceptre, we visited their marvellous museum – clean and well laid out. 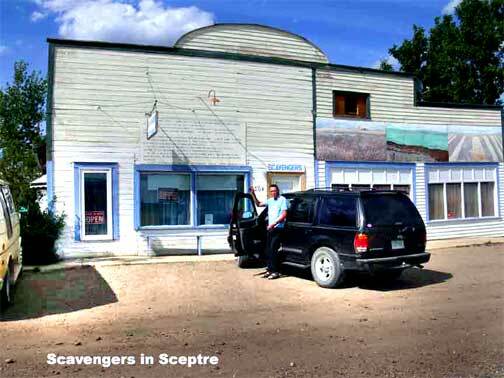 There are only about a hundred people in Sceptre, yet we were told the only government money in the museum is an annual grant for summer staff. 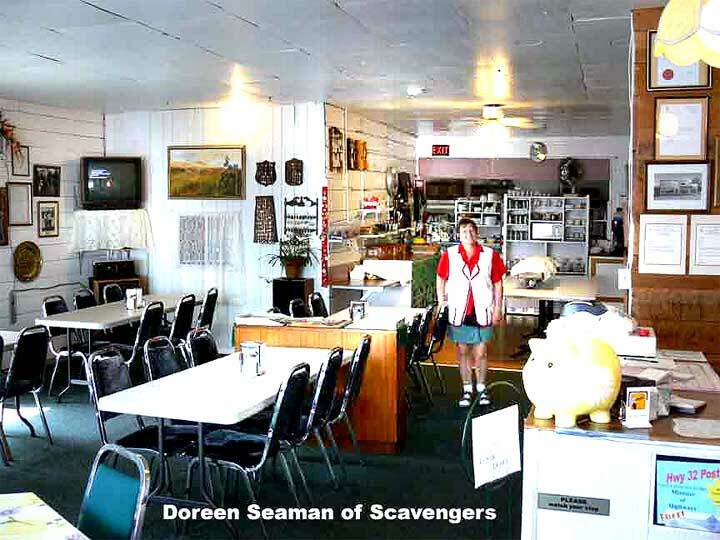 At Sceptre, there is a place called Scavenger – it is a café, movie rental, and huge flea market (over 5,000 square feet) run by Doreen Seaman. She scrubs up everything that comes in so there is no musty smell at all. Even some grease guns were sparkling clean! Home cooked food, daily noon smorgs that are very popular. Stop in, and tell Doreen we sent you!